A record-breaking crowd at Twickenham was left largely disappointed after England failed to secure a place in the Cup quarter-finals of the London Sevens on Saturday. 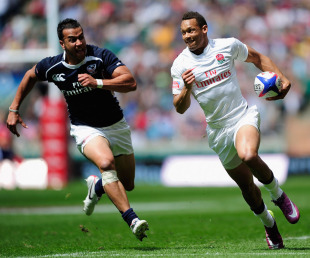 England opened their campaign with a 31-21 win over the United States, with Dan Norton helping himself to a hat-trick. However, they then slumped to a shock 21-14 defeat to France, much to the disappointment of the majority of the 54,357 fans in attendance. That left England needing to beat Argentina in their final game to secure a place in the Cup quarters but they could only manage a 12-12 draw, thus allowing the South Americans to progress in their place. Wales did progress from Pool A, though. Although they were beaten by IRB Sevens World Series leaders New Zealand, victories over Spain and Kenya saw them through. Scotland, meanwhile, finished bottom of Pool C after suffering defeats to Australia, Canada and Samoa. Elsewhere, Fiji pipped South Africa to top spot in Pool D courtesy of a 12-7 win over the Springboks. The attendance represented the one positive for England as it was the largest crowd to assemble on the opening day for an IRB Sevens World Series event. Rugby Football Union (RFU) business operations director Paul Vaughan said: "The first-day record is a testimony to the booming global popularity of sevens. We hope a good second day will take a sevens weekend past the 100,000 mark for the first time, which would be a magnificent achievement."